Former Women’s tag team champion Bayley was among the female competitors moved to SmackDown Live in the Superstar Shakeup. Bayley appeared on this week’s SmackDown to declare that she is now a singles competitor, officially dissolving her Boss ‘n’ Hug partnership with Sasha Banks. In her first SmackDown appearance as a singles competitor, Bayley had words with Becky Lynch and then competed in an 8-woman tag team match. Backstage after the show, Bayley explained that she’s ready for a change. This completely contradicts her attitude from Monday night, but it’s been a tumultuous week with WWE storylines. 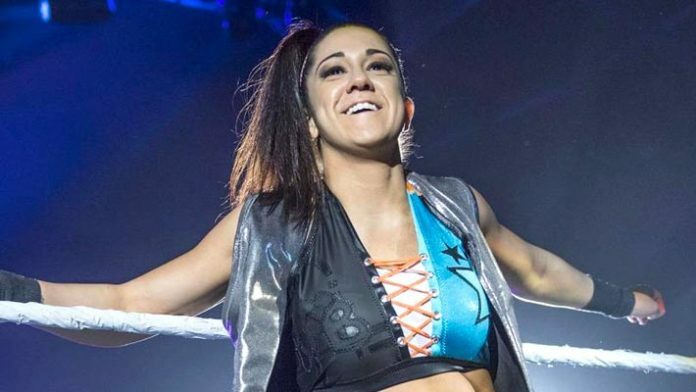 Bayley said it’s exciting to be part of SmackDown Live. She is evolving and welcomes the new challenges that await her and reiterated that her sights are set on Becky Lynch’s SmackDown Women’s Championship. Bayley later tweeted this message about her new role on SmackDown and her desire to dethrone “The Man” Becky Lynch.